It’s no secret, the statistics about pregnancy and infant loss are incredibly high. Every twenty minutes a baby is stillborn. One in four pregnancies result in loss. One in one-hundred and sixty babies are stillborn. I wish I knew all the statistics, but those are the ones I remember on the top of my head. Either way, that is a lot of babies, a lot of parents, and a lot of families experiencing this tragedy. Even more outrageous, there are so many people who don’t even know this still happens. I know I didn’t and I feel horrible for not ever recognizing this beautiful community of grieving mothers. A few days ago, I shared that I wanted to do a name project this month. Usually I like to do name wreathes and in December I wrote names on the beach. Well, the last two times I went to the beach, I wasn’t able to write names. So, I’ve been brainstorming on how I can write baby names creatively around me. Every June, the community I live in does garage sales. It’s sort of a big event for our small town, but it brings in a ton of people and it’s pretty fun. Usually, everyone walks to each sale and, honestly, it really is just a good way to bring neighbors closer together. With knowing this event is coming up (next weekend!) and having all the pregnancy and infant loss statistics flying in my head lately, I wanted to incorporate the two. But how am I going to do this? I’ve thought of handouts or writing on rocks, but I didn’t feel right. Then, I thought of writing names in chalk on the ground.I’m hoping it will be a way to provide healing to parents by seeing their child’s name written out AND bring some awareness to others. Sometimes it’s hard to see so many names… I wish the names would only fill up a small part of the sidewalk, but in reality it could fill up the whole entire street. That’s the reality of loss though. It can happen to anyone. I’m going to stop taking names on Wednesday night, since the garage sales start on Thursday. The plan is, I’ll write names down and take pictures of each baby name and then send them to their parents. Then I’ll post a big picture of how many names there were written on the sidewalk. 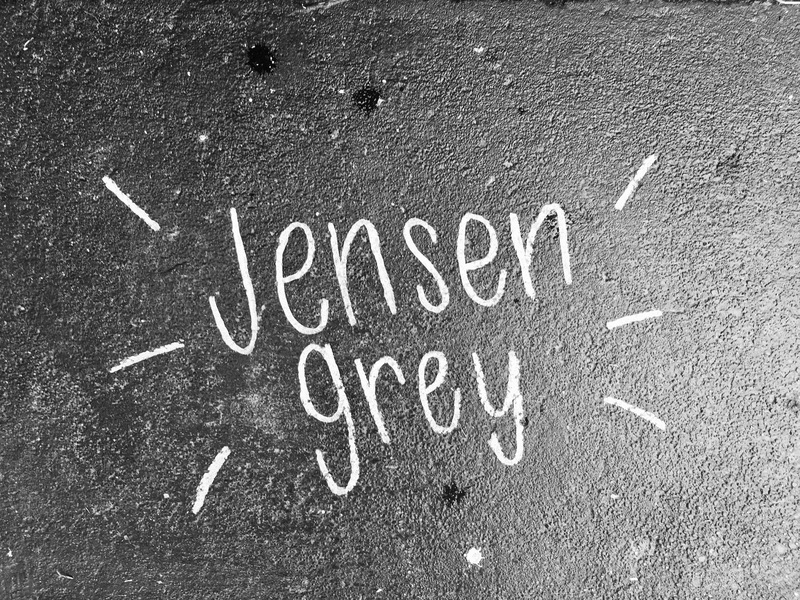 To submit your child’s name, (first and/or middle please) you can comment on where I share this post on Jensen’s Facebook page, on the picture that’s on here on Instagram, or you can comment below on this blog. If you do comment on here, please leave your email address so I can make sure the picture gets to you. Please feel free to share to your loss mom friends. It means the world to me when you all reshare and tag others because it really shows me how tight this community really is. Thank you all for participating and reading along. I’m excited to be able to do this project to help others and myself on our healing journeys. This entry was posted in grieving, Jensen, stillbirth and tagged baby loss, blog, child loss, grief, grief attack, grief journey, grief work, grieving, infant loss, infant loss awareness, Jensen, Jensen Grey, life, life after loss, loss, loss community, love, mama grief, Pregnancy and Infant Loss, Pregnancy and Infant Loss Awareness, share, stillbirth, stillbirth awareness, stillborn, Stillborn Still Loved by danielleridgway. Bookmark the permalink. LOVE this idea, Danielle! Especially that it will help bring awareness to this community. I could see a local newspaper or two loving this, too! Cathy, is their any way you could send me your email so I can send you a picture 💙 my email is danii_ridgway@yahoo.com if you’d like to send your email address there. My sweet twin girls are Claire Marie and Caroline Grace. Thank you for including them and bringing awareness! Veronica, is there anyway you could send me your email address so I can send you a picture 💕 My email is danii_ridgway@yahoo.com if you’d prefer to send it there. Such a nice idea, thank you. Hi thank you so much for doing this! Please add my babies name Rebecca Clara. Thank you! My son was stillborn at 40 weeks in January. His name is Gabriel Anthony.